Take Exit 52 onto Route 23 North. Continue on Route 23 for about 3 miles. Just prior to the 6th traffic light (just beyond a used car dealership/Coldwell Banker offices), take the exit for Kinnelon Road. Turn left at the light at the end of the exit ramp and go straight across Route 23. Stay on Kinnelon Road for about 2 miles (through 3 traffic lights). 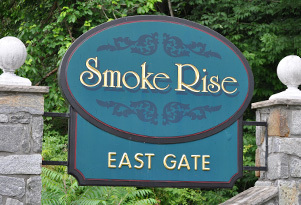 Watch for Cypress Restaurant on the right, and turn right just beyond it at the sign for Smoke Rise East Gate (Stone House Road). As you approach the gate house, stay in the left lane and stop at the window (explain that you are there for the horse show). After exiting the Gate House, the road will soon make a sharp bend to the left, after which you will come to a YIELD sign. Turn right at the YIELD sign (Stone House Road). Continue straight, and the horse show grounds are ahead about 1/4 mile. Approaching Kinnelon, move into the right lane. Immediately after Dodge dealership but before the traffic light, take the right exit (Kinnelon Road). 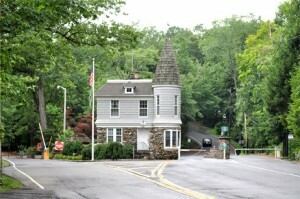 Turn right onto Kinnelon Road and follow as above. All horse show traffic must enter through the East Gate on Kinnelon Road.